Given we have a BBQ, my favourite bowls always start with a base of brown rice or quinoa, followed by a few oven roasted vegetables, a handful of herbs, some avocado to cut the heat, a squeeze of citrus, and finally, topped with a grilled piece of fresh fish. Lastly I’ll add these come together in half an hour, and you can make extras which will hold up for lunch all week (they even taste great cold)! Spread sweet potstoes on a baking sheet and sprinkle with paprika. Roast at 400F for about half an hour, until crispy on the outside and soft inside. (You can add olive oil as they roast to help them crisp up, but it’s just as good without- and lower on fat. Cook rice according to package instructions. I like adding the chopped cilantro and lime juice to my rice during the last minute of cooking. Otherwise, you can just too your bowl with a sprinkling of cilantro and squeeze of lime. Preheat the BBQ. Glaze salmon in teriyaki sauce and grill, brushing more glaze on as it cooks. Heat a cast iron pan to medium high heat and add broccoli, a tbsp of EVOO, and red pepper flakes. Once combined add soy sauce and hoisin sauce. Cook the broccoli for 5 more minutes, until just bright green and top with a squeeze of lime juice. Remove broccoli from pan and place aside to keep warm. Add mushrooms to pan and sautée for 2 minutes until they decrease in size. Remove from heat and stir in Swiss chard until wilted. 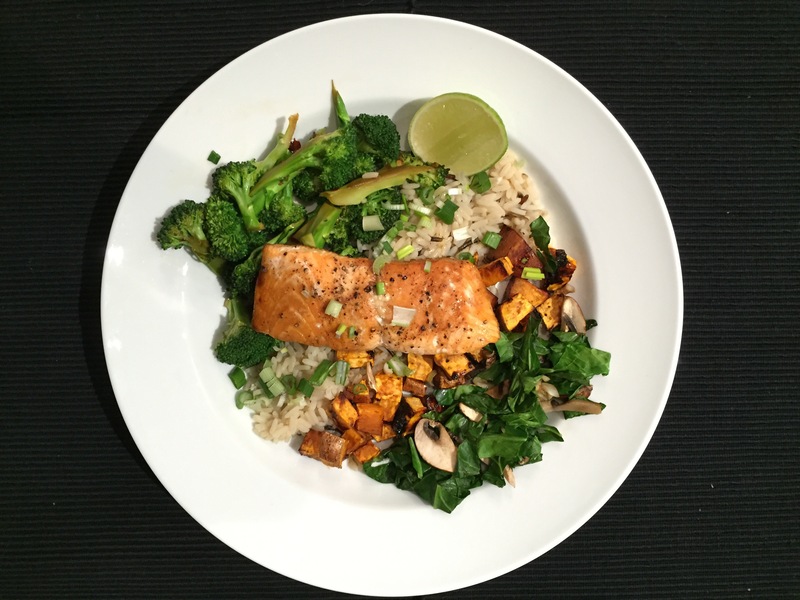 Plate the bowls – start with the rice, add sweet potatoes, broccoli, avocado, and swiss chard. Place the salmon on top. Top with a good squeeze of lime juice, more red pepper flakes, cilantro, and teriyaki sauce to taste.